The Lady Okie: 3 Things You Should Know About. You're Welcome. 3. You can have it delivered to your office or home... wherever! 5. You can rate your favorite snacks, so if you get something you don't like, you don't have to get it again. I've been getting Graze boxes for about a year now, and they are so much fun and delicious! You need an invite code to get in, so email me. I think I have 3 codes left! You will not regret it, and if you do, just cancel it. No harm done except the fact that you will have wasted one of my invite codes, in which case I will hate you forever. This is perfect for people like me who don't watch the Today Show every morning and don't really keep up with the Kardashians... I mean the news. Sign up for the Daily Skimm, and you get an email in your inbox Monday-Friday with all the top news stories both serious (like the government shutdown) and social (like who was nominated for Time magazine's person of the year). It takes me less than 5 minutes to read, and I feel so much more informed about life. You probably should still read the news, but at least with the Skimm you can have something to add to water cooler conversations with your coworkers. Thanks to Abbey for blogging about the Skimm so I could sign up in the first place! Thanks to Breenah, I now have a MyPoints account and earn points for online purchases. Basically, it's a site where you sign up for an account and then get rewards for things you buy online. It's really a win-win, because these are things I would already be buying. As you add up your points, you can redeem them for gift cards to restaurants, clothes, and even charitable donations. We're about to cash in on a $50 gift card from all of our Christmas presents. Woot! You can even earn points just for reading your emails or surfing the web, and you can get exclusive online coupons! I am only upset that I didn't know about this sooner. Want to sign up for a MyPoints account? Email me or leave a comment with your email address, and I'll send you an invite! I read the "you're welcome" like Sadie from Awkward in my head. And then I laughed out loud. Luckily, Chris is used to this. Graze sounds delicious and hit me up with the My Points deal. 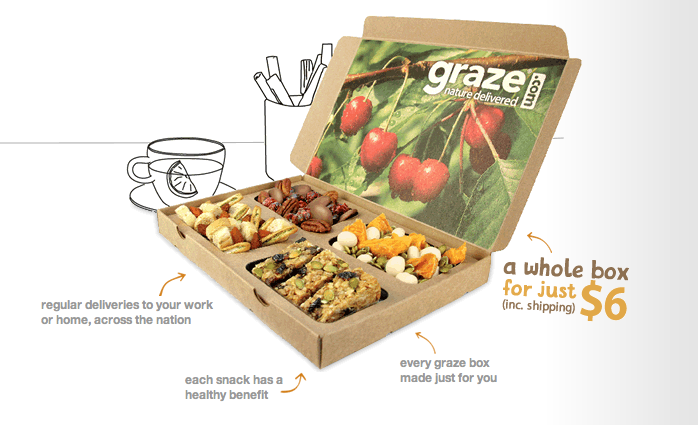 I have been drooling over the Graze website and it makes me sad that they don't ship to Canada. Some of the options look delicious! Um ... I need to sign up for the rewards just for buying things on-line. I'd be rich! May I have a code for Graze? Would love to try it. Phisigphilliephan@gmail.com. thanks looks yummy! Awesome things, thank you! Could you send me an invite for the MyPoints account please? I love online shopping, and I can't believe I haven't heard about this yet! I'm all for trying new things and would love to also get a code please. Ruby, I can't find your email address on your blog. Can you please email me: theladyokie@gmail.com with your email address? Thank you! Did you give out all your graze codes? Brittanymrasmussen@gmail.com please send one this way if not! awesome post! i've gotta check out the skimm. :) you've got a cute blog here! can't wait to read up!! Ok this Skimm thing sounds perfect for me to know what is going on in the states without to much info! I get Skimm, too! Much easier to handle than the vast ocean of news and news sources (which is right? unbiased?) that always seems to want to swallow you whole! And I totally would love for you to send me an email invite for My Points! There really is not catch besides signing up?! The Skimm is such a great idea. I keep bouncing around from sources (news and popular) to get the best headlines. I use the PULSE app but it's tiring. This is perfect! But so is just waiting for my husband to say, "Did you hear..."
I'm surprised people don't know about mypoints! I've been a member since 1999 or so! I've earned tons of gift cards over the years and recommend it! I've been doing mypoints for years. Mostly I just get the points for reading the emails but they still add up. Just signed up for The Skimm. Thanks for the tip!! Going to check out the Skimm, it the MyPoints similar to ebates? I've been getting the Skimm now for awhile and I enjoy it. I'd love a Canadian edition though as while it definitely covers world topics, there is still a heavy USA focus. I need to sign up for the daily skimm! That seems like it's right up my alley even though I am also guilty of "keeping up with the kardashians." Thanks for sharing your favorite things with us! Ok, I seriously need to check out the skimm! I try to catch NBC nightly news when I can, but I'm usually a little clueless about what's going on the middle east, and I CERTAINLY don't know anyone's names. I need to check out MyPoints too! I'm doing more and more online shopping (maybe I'm becoming more of a hermit? haha). Would love a my points code!! Also checking our skimm..sounds perfect for me! I'd love to try the MyPoints program. I buy everything I possibly can online...this sounds fabulous! My email is leslielukensmartin@gmail.com. Look forward to hearing from you!